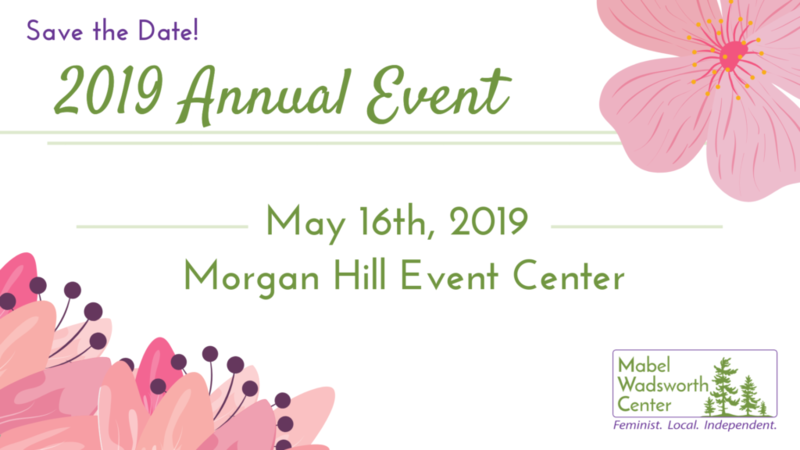 The Annual Celebration and Silent Auction will be held on Thursday, May 16th, 2019 from 5:30 to 8:00pm at the Morgan Hill Event Center in Hermon, ME. Corporate, organizational, and individual sponsors will receive early access to our silent auction from 5:00 to 5:30pm. At our awards dinner, we will be honoring two outstanding community activists: Quinn Gormley (she/they), Executive Director of MaineTransNet (MTN) will be receiving the 2019 Ruth Lockhart Feminist Activist Award; and Taylor Cray (she/her), student activist and former co-chair of the University of Maine Feminist Collective (FemC), will be receiving the 2019 Leadership Torch Award. Dinner will be served buffet style with entrée options of baked haddock, chicken, and vegetable lasagna. Gluten-free and vegan options will be made available upon request. For event updates, check out our Facebook event. Help sponsor the event or submit a congratulatory message for our awardees! Select your sponsorship level when purchasing tickets, then please contact Nik Sparlin at nik@mabelwadsworth.org with and dietary restrictions, the name(s) of your guest(s), and ad specifications, as applicable. $175 Healthcare Advocate (Individual Sponsors Only): One ticket and name listed in event program. Early entry into silent auction. $250 Feminist Activist: One ticket, name listed in event program, 1/4 page black and white ad. Early entry into silent auction. $500 Indie Pioneer: Two tickets, name/logo listed in event program and on-screen, 1/4 page black and white ad. Early entry into silent auction. $1,000 Community Champion: Four tickets, name/logo listed in event program and on-screen, 1/2 page black and white ad, promotion on website, and in e-newsletter. Early entry into silent auction. $2,500 Resistance Leader: Four tickets, name listed in event program and on-screen, podium recognition at event, 1/2 page black and white ad, promotion on website, in e-newsletter, and on Mabel’s social media accounts. Early entry into silent auction. $3,500 Founder’s Circle: Six tickets, name listed on Facebook event cover, event program, and on-screen, podium recognition at event, full page black and white ad, promotion on website, in e-newsletter, on Mabel’s social media accounts, and in event press release. Early entry into silent auction. $5,000 Presenting Sponsor: Reserved, branded table (8 seats) at event, name/logo featured on Facebook event cover, program booklet, and on-screen at event, recognition from podium at event, full page color ad, promotion on website, e-newsletter, Mabel’s social media accounts, and in event press release. Early entry into silent auction. If you have questions about the 2019 Annual Celebration and Silent Auction, please email Nik Sparlin at nik@mabelwadsworth.org.